My 4th Mac & Cheese Night took place at the East Bay’s prime mac & cheese destination along 40th Street in Oakland: Homeroom. Nearly every time I’ve mentioned my mac & cheese quest, I’ve been interrupted by an excited new acquaintance asking if I’ve tried Homeroom yet. Finally, FINALLY, I can say yes when asked. Schoolroom décor in keeping with their name. I approve. 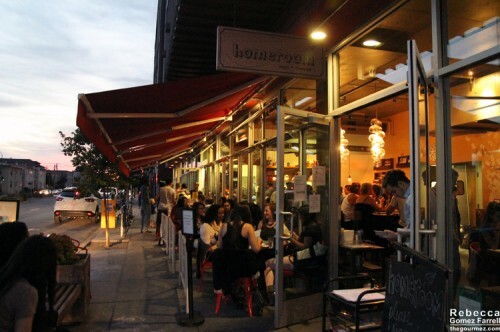 Homeroom is owned by a pair of friends with a passion for comfort food, Allison Arevalo and Erin Wade, who also happen to both be pregnant with their second children right now, which I found out from reading an article about their planned expansion for Homeroom in the fall. That expansion will be geared toward meeting their to-go and large party needs, which are big contributors to the constant wait times at the midsize restaurant. Well…the fall is not now, so our party of six was prepared for those long wait times at 8 on a Friday night. I had to laugh when I signed us in and asked the host if we would fit—there are not many tables available for more than four people. “Oh, no problem,” he said, quickly followed by a snarky, “but it’ll be a minute.” I knew a minute would be a lot longer than that and it took over an hour. At least owner Erin made the rounds of waiting customers, offering water. Much appreciated! Once inside, the sheer volume of mac & cheese possibilities overwhelmed us. You’d think an hour of waiting would be enough time to make up your mind—think again! 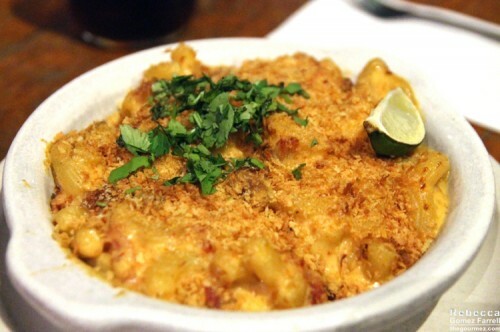 Homeroom offers 12 takes on mac & cheese ($9–$16) with over 20 add-ons. What most impressed me about Homeroom was how completely unique each of their mac & cheeses are. I only tried bites of three, but their flavor profiles were night and day from each other, making it easy to see why so many people come back so often—it’s an entirely different meal each time, even if the base components of cheese sauces and pasta are the same. 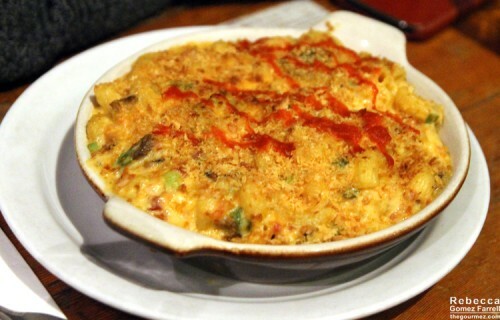 Despite the plethora of options, I’ll use my Dungeness Crab Mac as the basis for my rating. Price: $15.95, the most expensive on the menu. 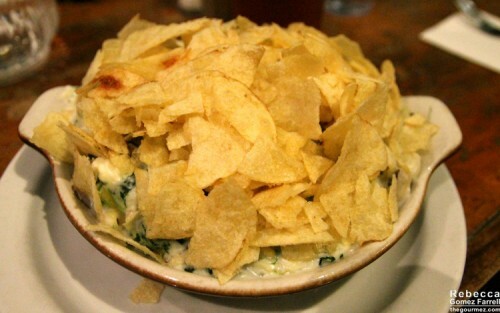 And for good reason; it’s overstuffed with crab! So much crab! Cheese: Havarti and Pecorino. The flavors were strong and complementary. Creamy vs. Stringy: All of Homeroom’s sauces were cream based and so thick, I considered running the fork test. That’s my biggest complaint, actually—the dishes were so rich and dense that I felt intimidated by the undertaking. This did not trouble my companions. Noodles: Jumbo, ridged macaroni cooked al dente. Choosing large pasta was a wise decision for such a thick sauce—smaller pasta would suffocate in it. 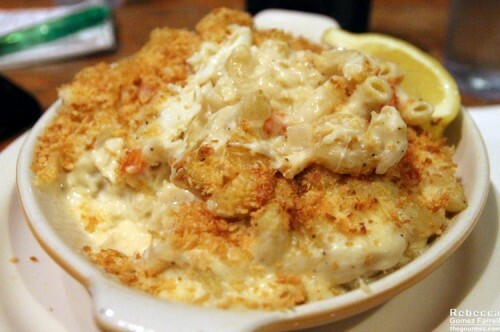 Breadcrumbs: Comes with several varieties, including the Dungeness Crab. Other options like potato chips are available as add-ons. Nicely browned and plentiful, offering an effective crunchy counterpoint to the rich sauce. Grease: None to speak of, not even in the leftovers. Verdict: The Dungeness Crab was a great mac & cheese! The lemon and Old Bay seasonings cut through the thick sauce expertly, and red bell pepper bites also livened up the dish. I’m amazed with how much crab I had in each bite. That made it worth the high ticket price. The onions, however, were chopped larger than I’d like, which was mostly noticeable because they were on the edge of raw, giving the dish a bite that distracted from the rest of its flavors. And I definitely think it needs more than the one wedge of lemon—my waitress never did come back with more. The helping size is generous, and though most of my companions finished their plates, none complained of being overstuffed later, which is always a plus. 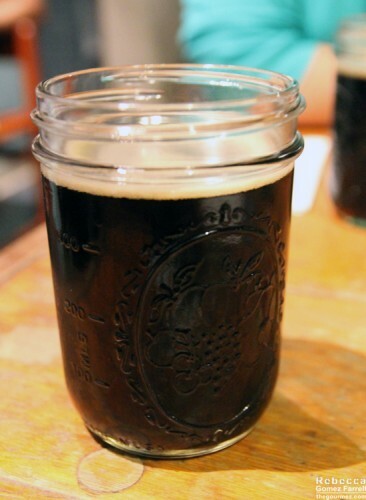 We also shared a pitcher of the Big Apple, a Homeroom creation of stout beer and hard cider. A pitcher breaks down to four drinks at $5 each, which is affordable enough that I won’t judge them for serving all beverages in mason jars. The pleasing waft of apple coming from the pitcher was a plus, as was the way in which the apple flavor enlivened the stout. I’ll be recreating the Big Apple at home. So…Homeroom was great! 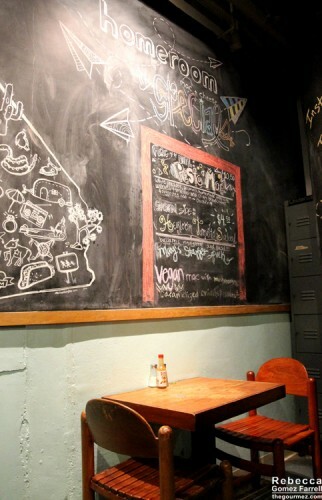 I wouldn’t hesitate to go back, though I’d likely wait until their new space opens if I have a large party again. Thus far, I’m ranking the Tipsy Pig’s mac & cheese higher because their masterful use of bacon left a lasting impression and Homeroom’s sauce, though impressively varied in flavor depending on the dish, was just too dense to completely win my heart. However, Friend #2, who’s been at all mac & cheese nights so far, thinks I’m crazy for placing the Tipsy Pig above Homeroom. And I’d bet all those people who’ve had Homeroom’s name on the tips of their tongue when I’ve mentioned my quest would agree. Would you? P.S. The Husband has declared Homeroom to be far too hipster because I was one of three people photographing their food at the same exact time. I, however, felt a universal sense of foodie camaraderie. The mason jars, though…he has a point. I’ve been reading about your mac & cheese nights with admiration and a bit of jealousy. There aren’t enough restaurants in DC that focus on mac & cheese to make this possible…but it sounds like a delicious adventure. I figured it was a great way to get myself out and trying restaurants in the Bay Area! I wouldn’t say most of them focus on mac & cheese, however, but they do have a reputation for offering a great one that stays on their menu season after season. Homeroom & Mission Cheese are probably the two I’ve tried so far that have a cheeserific concentration. But I think next month’s will be America Melt Kitchen, which definitely has a cheese focus as well–and a mac & cheese sandwich!